Every morning many boats are hauled down into the water with help from other fishermen waiting to get to their boats. This is an extremely cooperative move by all the fisherfolk within the village. Every evening these boats are hauled back up. This is a procedure that helps protect the boats if a storm would come into the region suddenly as well as keeping the boats cleat of marine organisms that could damage or destroy the hulls. The boats are being hauled up in October of 1993 as a large storm is sweeping into the region. 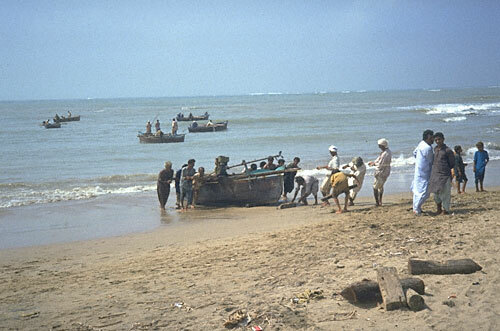 I helped the men haul in the boats as every hand in the village was occupied with this coming disaster. If the boats were not hauled in, the storm would have swamped and sunk many of the vessels. The rain came just as the sun set and the winds drove it into the wooden slats of my rented hut (there was no glass, electricity, or running water!). During October, the heat was almost unbearable, so despite the destructive nature of the wind, it was a welcome respite from the heat.